Most of the time we need to add citations in active document. These citations are very important for us. During pursing doctorate in any subject you have to submit your thesis. They have to prepare his thesis in MS Word. 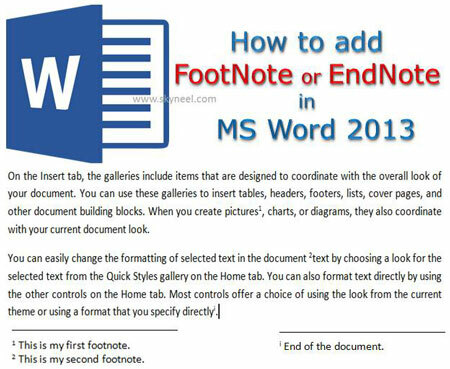 Most of the person have to add FootNote or EndNote in MS Word. These are an important option of MS Word which is used to give additional source information of selected text or word. First we need to know what the FootNote and EndNote and what is the importance to add them in the active document. FootNote and EndNote is used to describe any additional information and these information found either in the bottom of the page or end of the document. FootNote shows the source of additional information about the selected text. FootNote is shown by small number after the selected text while EndNote is shown by the small “i” sign after the select text in the active document. FootNote: FootNote is a note of text which is used to add any selected text in the FootNote. FootNote is placed at the bottom of active page of active document. EndNote: EndNote is a note of text which is used to add any selected text in the EndNote. EndNote is placed at the end of the active document. Step 1: Select the text which you want to add in FootNote. Step 2: Click on the Insert FootNote option which is placed in the References tab. You can also press Alt+Ctrl+F short-cut key to immediately add the selected text in the FootNote. Step 3: If you want to add more than one FootNote in active document then you have to repeat the step number 1 and 2. Step 4: If you want to navigate to the next or previous FootNote in the active document then you have to click on the “Next FootNote” option and choose Next or Previous FootNote option which is placed in the References tab. If you want to view active page FootNote in the document then you have to click on the “Show Notes” option which is placed in References tab. Insert EndNote option gives you facility to add an EndNote and placed it at the end of the document. Step 1: Select the text which you want to add in the EndNote. Step 2: Click on the Insert EndNote option which is placed in the References tab. You can also press Alt+Ctrl+D short cut key to immediately add the selected text in the EndNote. Step 3: If you want to navigate to the next or previous EndNote in the active document then you have to click on the “Next FootNote” option and choose Next or Previous EndNote option which is placed in the References tab. Step 1: Select the number or symbol of the FootNote or EndNote in the active document. Step 2: Press Delete key to immediately remove the selected FootNote or EndNote from the active document. Note: When you remove any FootNote or EndNote from the active document rest of the FootNote and EndNote numbering automatically reset. I hope you like this Add FootNote or EndNote in MS Word guide, after reading this article you will be able to easily add FootNote or EndNote in MS Word. If you have any suggestion regarding that article, then write us in the comment box. Thanks to all.